Find out how this intriguing blend of genres was created. 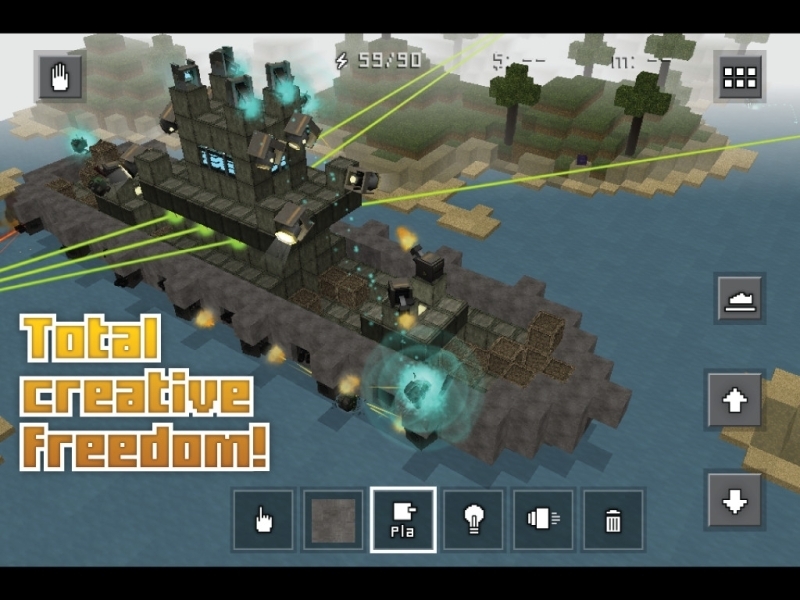 Earlier this month, we brought you our review of Foursaken Media's Block Fortress, a clever blend of the tower-defense, first-person shooter, and sandbox world-building genres that's still riding high on the App Store charts. We recently took the chance to speak with Jamie Jackson, one of the four brothers that comprise Foursaken Media, to talk about planned updates for the game and how this unique blend of genres came to be. First of all, could you say a little bit about your development backgrounds in your own words? Well, we're four brothers. Two of us have degrees in Computer Science, another a degree in Multimedia & Web Design, and I am pretty much self taught in 3D art (I was a teacher before) ! While some of us dabbled in game development and design in our own leisure time, and we were all avid gamers throughout our lives, we really didn't have much experience in the professional game development scene until we just kind of jumped into it with our first game 3 years ago: N.Y. Zombies. During the creation of that project, we learned a ton - we all had these applicable skills, but it wasn't until that game that we kind of put them to good use in game development. It really was a cool thing for us, that we all just happened to have the perfect, intertwining set of skills from 3D art, to 2D art and UI design, to game coding, to low-level engine coding. We've seen a lot of hybrid games on the App Store over the last 12-18 months. How did you come to work on a title that combines tower-defense with first-person shooting and sandbox world-building? Well actually, the original idea for the game came from building sand castles on the beach. We always liked to build up these huge sand fortresses, and then see how long they could survive the incoming high tide. That sort of sandbox building is where we were inspired by the Minecraft aesthetic and block building mechanics - its really the only feasible way we could think of to give players that kind of total build freedom. 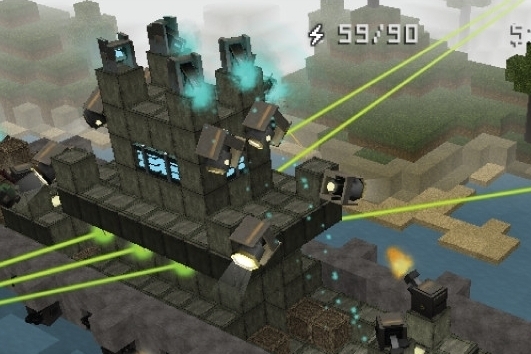 The tower defense part was just a natural extension of building a freeform fortress and surviving. The FPS portion came about half way through development - we just felt we needed a little something extra during the incoming waves of enemies to keep the game-play engaging. We could've done other things like global abilities, etc. but we ultimately felt it would be cool to actually walk around and participate in the defense of these huge, towering fortresses that players created themselves. How long has the game been in development for and what challenges have you faced in bringing the game to market? Block Fortress had been in development for about 5 months - and its really been a pretty smooth experience! We were very fortunate to get some amazing features by Apple, so that of course sweetened the deal. We felt the upgrade system did a good job of encouraging gamers to have one more go for the next upgrade. How did you go about designing that balance between rewarding players for gameplay, and giving players too much at once? A lot of play-testing really. We just kept playing over and over from scratch, feeling out the progression. We don't balance at all with in-app purchases in mind, so we just go for what feels right. Also, since there are a limited amount of upgrade slots, we had the leeway to have both cheap, but worse upgrades, and better, more expensive upgrades. This way the player always has something to buy and upgrade, but there will still be strategy and long-term planning for the best mods. The game has a very open-ended feel to it. Do you have any plans to add more structured content in the form of missions or campaigns? Maybe not in the sense of missions or a campaign, but more in the form of new gameplay modes - many of which will be more structured just by their very nature. Although, mini missions/objectives that you typically see in endless runners could be something cool. Many people feel uncomfortable with the idea of premium games that also have in-app purchases attached. What was your decision process behind including them with the game? We have a clear conscience about adding IAPs, because - whether people believe it or not - we balanced the game completely in and of itself, without any thought about IAPs - any IAPs that are there are completely extra, tacked on for those who want a means to progress faster then you're supposed to. So in the end, the game would have been the same with or without them. That being said, thankfully we haven't gotten much backlash about IAP in Block Fortress because I think people recognize that. Is there anything else we can expect for Block Fortress in a future update? When can we expect to see a release? We have a tentative schedule for new updates. The next one which will be submitted soon, will include an upload/download system for peoples' fortresses, which should be a great new community/sharing mechanic. We're also working on a "pure" defense mode, without any FPS sequences at all. We know there are a lot of players who struggle with virtual FPS controls, no matter how they are implemented, so we're making sure we cater to them too. Finally, down the road we definitely have plans to add both co-op and PvP [player-versus-player] multiplayer modes. There are so many cool ideas we can do with multiplayer, the hardest part is going to be choosing which modes to start with! Do you have plans to bring the game to any other platforms - Android being the obvious candidate? If not, what are your reasons for sticking to iOS? The better our games do, the more we have started thinking about porting. Before, it just didn't make sense - we're a small team and we just didn't have the resources to look into other platforms. Now, with both Heroes and Castles and Block Fortress seeing some really amazing success, we are going to at least investigate the possibility, including porting to Mac, Steam, and Android. No guarantees on any of those, though - again, right now we're just looking into the possibilities.